Werner’s 2019 whitewater paddles have just dropped and to celebrate, we have a treat for our loyal readers. We’re giving one lucky paddler the opportunity to win a Werner Surge or Werner Strike. To enter, complete the form below with your first name and email address. Once you’ve entered, share to earn 25 bonus entries. Watch the video above to see these sweet paddles in action. Then check out what’s new from Werner Paddles in our Paddling Buyer’s Guide. Why I love the shuttle? JoAndra (Jo) Proia is an L2 ACA Certified Coastal/River and L2 SUP Instructor, L1 Yoga Teacher and Director of Women’s Programming for Get Outdoors Paddlesports in Greensboro, NC. 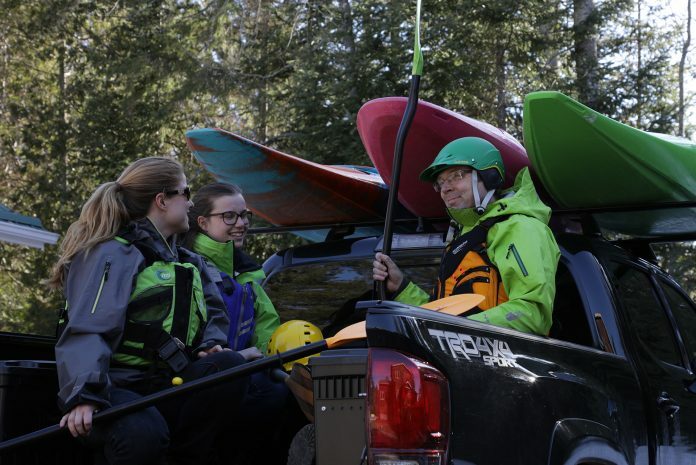 In 2012 Jo founded the dynamic women’s paddling organization GET:OUTDOORS WOMEN ON THE WATER. She is also a published author of the guidebook: “Piedmont Lakes, A Practical Guide for Boating in the North Carolina Piedmont” and she is the monthly outdoor writer for Natural Triad Magazine. Kevin Hart’s talk about whitewater rafting will be sure to make you laugh. The American comedian, actor and producer talks about a TV show that he is preparing to film. The show is based on him doing things that “black people are typically afraid of doing” he said. He gives examples like bungie jumping, skiing, sky diving, and whitewater rafting. The producers of the show needed to know that Kevin was actually going to pull through on the show and not back out at the last minute. Kevin offered to take his family whitewater rafting to reassure to them that he was capable of doing some of these more adventurous activities. His description of his experience rafting is humorous, but it is one that many whitewater rafters would understand. All of the ominous safety instructions he was told by guides are not a stretch from what is actually shared with new rafters on a daily basis. Anyone with previous rafting experience will recall guides giving instruction not to stand in whitewater because of potential foot entrapments, or that you must aid your own rescue by either swimming back to the raft or to one of the shores that a guide identifies before the set of rapids that you hit. For those who have been rafting before, you know that it is the people that flip out of their rafts that usually have the most fun and will be the ones sharing their stories by the fire that night. Raft guides are well aware of this and are the first people to purposely flip a raft to amp up the fun. Who isn’t down for a little extra fun in their life though? Kalob Grady is a professional kayaker and head kayaking coach at World Class Academy. When he isn’t shaping the next generation of kayakers he travels the world pursuing his own passion for whitewater kayaking trying to become the best that he can be. After he released his 2017/2018 highlight reel in April 2019, we reached out to get some additional information on his past seasons. 1) Where did your paddling take you in 2017/2018? The past 2 years have bought me to some tremendous places. Highlighted by trips in 2017 to Hawaii, Chile, Uganda and Zambia and in 2018 to Mexico, Bolivia, Chile, Uganda, and India. In addition to all the incredible kayaking closer to home throughout North America in the Northwest Territories, BC, Northern Quebec and the Pacific Northwest. 2) Favorite place you paddled in 2017/2018? Uganda has always been special to me, so with the completion of the Isimba dam coming closer everyday throughout the past few years, I made three separate trips to the mighty White Nile throughout 2017/2018. To make as many memories as possible, to share this magical place with friends and family, and to sadly say goodbye to Nile Special on my final trip in October 2018. Over the past two years, I have been the Head Coach for World Class Academy, a kayaking focused, travelling high school. I feel my biggest accomplishment in 2017/2018 was maintaining a balance in my commitment to share my passion for kayaking and experiences on the river with the next generation though WCA and in making the most on my breaks from school to push myself and to continue striving to be the best kayaker that I can be. Similar to my biggest accomplishment, I believe my biggest challenge throughout the past few years has been to find the ultimate balance of work and play. Knowing when to put my head down and grind through and when to take full advantage of opportunities that come my way. I don’t know if it is still considered ‘new’ but the Jackson Kayak Antix is beyond versatile. As seen in the video, in is the ultimate downriver play tool, but also a weapon for big wave freestyle or running 50ft waterfalls. The 1 boat to rule them all if you will! 6) What did the Nile Special mean to you? Nile special meant a lot to me to say the least. It was my first international kayaking trip when I was 16. It taught me so a lot about kayaking and freestyle, and about myself and how I can learn from mistakes and why perseverance is important. I met a few of my closest friends there waiting in line, have made more memories there than anywhere else in the World, have shared time there with friends that are no longer with us. It will forever be a place that I remember, it shaped who I am today without a doubt and I cant wait for the day that we ‘dis-assemble’ that stupid mass of concrete and let the Nile flow free once more. In May of 2018, SPOT released its newest device called SPOT X which is their first venture into a two-way satellite messaging system. 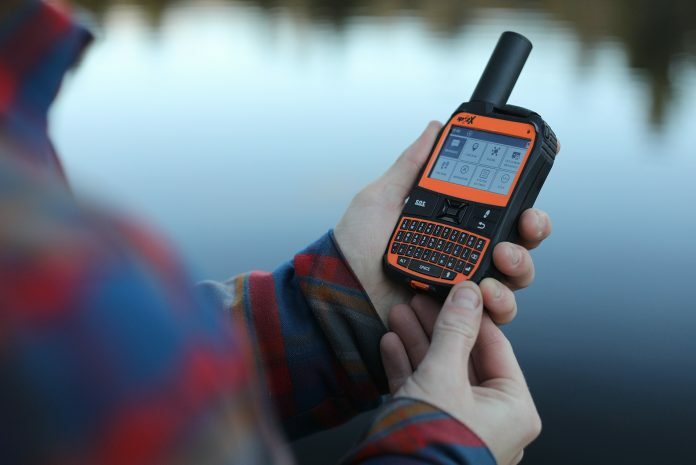 I had an opportunity to test this device while doing a 10-day canoe trip circumnavigating Algonquin Park on a route known as The Meanest Link. On this challenging 424-kilometer route it was not only important to have this device for safety, but it allowed us to provide real-time updates to those who wanted to follow along online. SPOT is known for its tracking feature that allows users to set up a landing page for friends and family to follow their adventures in real time. 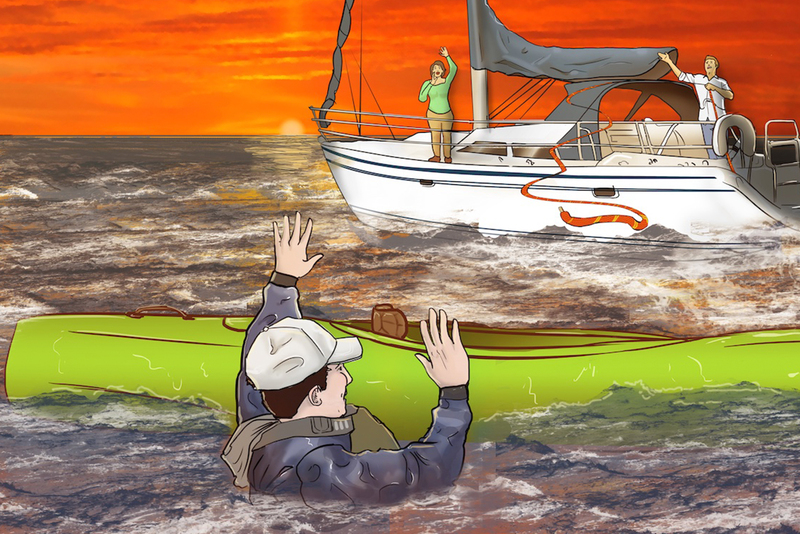 Previous models, including the GEN 3, featured the ability to send custom messages you could set up before your trip, in addition to the important SOS button a paddler could press in the event of an emergency to initiate a rescue. In using the previous GEN 3 model, I struggled to decide what to set the messages to. How do you protect yourself against every possible scenario with only two custom messages? This is one of our favorite things about the new SPOT X with two-way communication. The new SPOT X worked perfectly for our messaging needs. While on our trip, we shared daily text updates to keep family and friends informed on our distance travelled, number of portages and exciting experiences along the way. We added contacts to the device before we left and could send and receive messages from either text or email. We chose to send these directly to a friend who was publishing them to our Facebook page on our behalf. You are currently able to send messages directly to a Twitter account but unfortunately, due to a Facebook update, the X cannot publish directly to your Facebook page. We are unsure if this is something that they will be able to remedy in the future. The two-way messaging is ideal in circumstances where you require non-emergency assistance. Rather than being forced to use a catch-all message like in previous models, this would allow you to email your friends with the specific help you need. This will also ensure you are not rallying a helicopter for a non-life-threatening emergency. The daily text updates were a nice addition to give context to the tracking link we had shared before leaving. The tracking link allows you to set up an interval for which the device will ping your location and send it to a page where people can follow online. Intervals can ping at 2.5, 5, 10, 30 or 60-minute intervals and you can set your page to display all pings for up to seven days. We were happy with both of these functions and, of course, for the SOS functionality, which we were thankful not to have to use. The interfaces on both the device and online are very user friendly and there is a lot of support available online including the ability to call their support team to ask questions directly. We like the rechargeable battery and we recharged on the go with our portable battery power bank. We didn’t quite get 10 days of battery out of a single charge, but we were tracking at a high interval (every 10 minutes) which uses more battery. We were also sending out a high number of messages each day. Where we would like to see improvement is in the ability to resend messages. There were a few times that the interface would show an exclamation mark next to a sent message, indicating that the message had not been sent. This can be a challenge with satellite-based devices since you need an unobstructed view to the sky in order to successfully send a message. In our situation, many of our campsites were in densely forested areas. Ideally SPOT would add an option to resend or alternatively allow you to copy and paste your last message so you can send it again, rather than retyping it a second time. As it turns out, all of our messages that had the exclamation mark had actually been delivered. Tracking: Available on 2.5, 5, 10, 30- or 60-minute intervals to ping your current location. Check-in: Quickly and easily let everyone know you are okay. SPOT offers a variety of different coverage packages. Similar to a cell phone, after buying the device there is a cost to receive service. If you are someone who will regularly need access to your device there are monthly plans between $12 and $30 per month (based on a 12 month contract) depending on how many messages you would like to send. Alternatively, if you are someone who goes on one or two big trips per year that you would like to be covered on, SPOT offers flex packages. These packages cost between $15 and $40, again depending on how many messages you want to send, that allow you to purchase only a month of coverage at a time. Something that SPOT previously did not offer. Wade Harrison has a video posted on his Youtube channel showcasing a kayak that explodes while going down the last drop on Avalanche Falls. An experience that would have likely been terrifying for the individual inside the kayak. Great to see that the paddler was wearing a helmet and PFD and had the support of his friends on this run. You can see he managed to swim off to river right just before the next set was starting. Some great comments from others on the video highlighting that he did in fact make his roll and that this should not have been considered a swim. Please be advised the language may not be suitable for all audiences. Need a new kayak? Check out our Paddling Buyer’s Guide. On April 1, 2019,The Honorable Pablo Rodriguez, Minister of Canadian Heritage and Multiculturalism announced that the Canadian Canoe Museum would be receiving $10 Million in funding towards their new building in Peterborough. The location for the new facility will be at the Peterborough Lift Lock on the Trent Severn Waterway. The existing location was heavily restricted by its size, with many of the 600 watercraft and thousands of artifacts not on display. The new $65-million, 85,000-square-foot building will replace the 1960s-era building and boast the world’s largest collection of canoes, kayaks and paddled watercraft. “Our government knows that investments in arts and culture help build vibrant communities and support local economies,” Rodriguez said. “It’s the largest investment the canoe museum has ever seen,” said Executive Director Carolyn Hyslop. With our world-class collection as a catalyst, The Canadian Canoe Museum inspires connection, curiosity and new understanding. In partnership with individuals, groups and communities – locally, provincially and nationally – we work to experience and explore all that our collection can inspire. This sees students opening their minds in our galleries; community members connecting through artisanry; people of all ages getting on the water and learning to paddle; and exhibitions and events that spark conversation and collaboration. Sean Danielson is a lucky man. After nearly three hours in the frigid waters of Chesapeake Bay, the kayak fisherman was hypothermic and barely conscious. The sun had just set, and if Lana Lohe hadn’t put her camera down at that instant and caught the unusual streak of green in the corner of her eye, then Sean Danielson would certainly have died that April evening. The mere fact that Lohe and her husband Robert passed that spot at that moment, after 18 days sailing from the Bahamas, was an extraordinary coincidence. A miracle, some would say. After all, theirs was the only boat Danielson had seen all day. Sean Danielson is indeed a lucky man, but there’s a lot more to the story of his capsize and rescue than luck, or the everyday heroism of those who pulled him from the freezing bay waters. And, like many things in life, it began with a little fatherly advice. Danielson grew up fishing with his dad, and when he moved home to Connecticut to help after his father broke a hip a few years ago, they picked right up where they’d left off. Often, they fished from kayaks, and on those hot summer days when Danielson would slip off his life jacket and set it behind his seat, his father would gently chide him. The lesson stuck, and when Danielson moved to Maryland and began fishing the sometimes-turbulent waters of Chesapeake Bay, he never failed to wear his lifejacket. As the striped bass season neared in the spring of 2018, he became obsessed with catching the hard-fighting trophy fish from his kayak. The books he read and the old-timers he talked to all had the same advice: Fish the drop-off, where the depth goes from about 10 feet to 40 feet or more. That’s where the stripers are. He bought a depth finder, and one Saturday that April he paddled out into the bay for what seemed like miles. By the time he got back to the dock his girlfriend had already gone home—she thought he’d decided to paddle all the way across the bay. In fact, he hadn’t gone far enough. He didn’t find the depth line. That Wednesday he tried again, starting at about 3 o’clock in the afternoon and paddling due east into the bay. This time he didn’t tell anyone where he was going. Dressed in jeans and a long-sleeved shirt under his lifejacket, he was comfortable enough in the 55-degree weather. The water temperature however was just 47 degrees. Danielson, who had done almost all of his kayaking on protected lakes, took a few minutes to find his paddling rhythm in the choppy bay. “It was awkward at first, but I learned to just relax, keep my center of gravity low and just kind of go with it,” he says. From that instant, the clock was counting down. Thanks to his lifejacket he wasn’t at immediate risk of drowning, which is the leading cause of kayaking deaths. But the next most common cause of kayaking deaths is hypothermia. In 47-degree water, a healthy man of Danielson’s size can expect to survive anywhere from one to three hours. It’s an inexact science, but there was no uncertainty about the setting sun. It would slip below the horizon in less than three hours, taking all realistic hope of rescue with it. Danielson took stock of his situation. “I remember specifically telling myself to stay calm. I told myself, ‘It’s OK. Flip the kayak over and get back in.’” But when he righted the kayak, I was completely full of water. He was paddling an Old Town Vapor 10, a 10-foot sit-inside kayak that retails for a few hundred dollars. A reasonably athletic kayaker can scramble aboard a sit-on-top kayak after a capsize, and with practice it’s possible to remount a sit-inside kayak if it’s equipped with bulkheads dividing the hull into separate watertight compartments. The task is almost impossible in a kayak like Danielson’s, a sit-inside with no bulkheads. He scanned the horizon for boats, but saw none. Nobody knew he was out there. 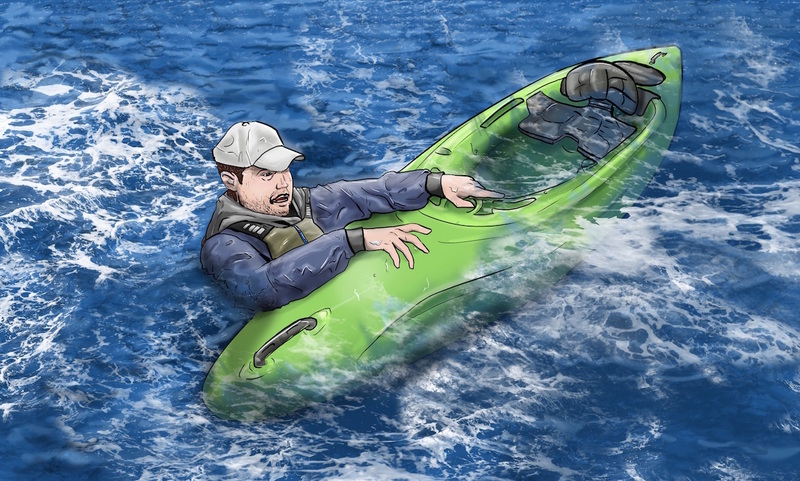 He thought about leaving the kayak and swimming for shore, but he decided that staying with the kayak gave him the best chance of being seen, and being seen was his best chance of survival. Realistically, it was his only chance. “In the beginning, I told myself I am not going to die in the Chesapeake Bay. It’s just not gonna happen,” he says. For more than two hours, as the sun tracked toward the horizon, he kept trying to right the kayak. He tried straddling the upside-down hull, but couldn’t keep his balance. He found a cup floating in the water and tried to bail, but it was no use. The bay was completely empty, except for the container ships ghosting down the shipping channel. They were as far from Danielson as the shore—about two miles—but still he waved and wailed on the orange plastic whistle clipped to his lifejacket. That same evening Lana and Robert Lohe were motoring north in their Catalina 36 Our Diamond. They’d spent the previous six months living aboard the 36-foot sailboat in the Bahamas. Now, after 18 days travelling up the Intracoastal Waterway they were barely an hour from their Annapolis home. “We were reflecting on what a wonderful trip we’d had, and I was taking pictures of the sun setting—it was a beautiful sunset—and just when I was getting ready to set the camera down I saw something,” Lana Lohe says. She thought it looked like a piece of carpet; to Robert it looked like a patch of seaweed. But when she looked again with the binoculars she saw an arm moving. “I told Robert, ‘I think there’s somebody in the water. Oh my gosh there’s somebody in the water. Turn! Let’s go!’” she recalls. Now they could hear Danielson’s whistle, and see that the splash of color wasn’t carpet or seaweed. It was an overturned kayak. The Coast Guard responded instantly, and as Robert reported his location and the nature of the emergency he looked over his shoulder and saw that Danielson was still in the water clinging to the ladder. He was too cold to move. Robert set the radio down for a moment, grabbed Danielson under the armpits and heaved him aboard. Lana bundled him in a fleece blanket. He was safe for the moment, but still dangerously hypothermic. He needed to get to a hospital, and fast. The moment Capt. Bill Walls heard the Mayday call, he pointed his 29-foot bay boat at the only sailboat in sight. As he closed the three-quarter-mile distance to Our Diamond, he hailed Robert on the VHF, asking if he could render any assistance. Robert said yes. Our Diamond makes about 8 knots flat-out. Walls’ motorboat is nearly four times that fast, and time was of the essence. They decided to transfer Danielson to the faster boat, a feat that required no small measure of strength and seamanship. They brought the boats together stern-to-stern, and with Lana handling the lines the three men—Walls, his mate Mark Marra and Robert Lohe—passed the semiconscious Danielson into the motorboat. “I normally don’t run a boat that hard on the first trip of the year but I had her wide open, because I knew he needed help and he needed help quickly,” Walls says. Danielson was “reddish purple” and falling in and out of consciousness. Marra got him out of his wet clothes and into a dry sweatshirt, then kept him talking. Whenever Danielson started to drift off, Marra would slap his cheeks, his shoulders, his legs. He kept up a running banter, even cracking jokes. As they raced for shore, Walls and Robert Lohe worked the VHF. When Walls roared in to Rhode River Marina it was already full dark, and the lot was full of flashing lights. Danielson was admitted to the hospital with a core body temperature of 80 degrees, and over the coming days he made a full recovery. He even bought a new sit-on-top fishing kayak to target largemouth bass on inland waters. So yes, Sean Danielson is indeed a lucky man. If you’ve been reading closely, you may be keeping a mental checklist of the cardinal safety rules Danielson ignored or perhaps didn’t even know. He wasn’t dressed for cold-water immersion. He paddled alone, and didn’t tell anyone where he was going. He lacked experience on open water and his kayak, to put it charitably, was little better than a pool toy. In the end, that’s why Danielson agreed to sit down in front of a camera and recount his ordeal. To pay it forward. Because for all the things he got wrong, the one he got right—wearing his lifejacket—provides a lesson all of us can live by. YETI Holdings, Inc., a leading premium outdoor brand, announces a new addition to its tried-and-true stainless steel Rambler Drinkware line—the Rambler 24oz Mug. In addition, the company also reveals three new color collections, Reef Blue, Sand, and Canyon Red. “We are committed to expanding our product lines while continuing to lead with innovation, durability, and creativity,” says YETI CEO, Matt Reintjes. Designed with cold beer in mind, the Rambler 24oz Mug is for those who have superior taste, and require an unbreakable vessel for every occasion. Featuring elements that YETI fans have come to know and love, the dishwasher safe Rambler 24oz Mug is constructed with traditional Rambler 18/8 kitchen-grade stainless steel, double-wall vacuum insulation, and the brand’s ultra-strong QuadgripTM Handle built for celebratory cheers. 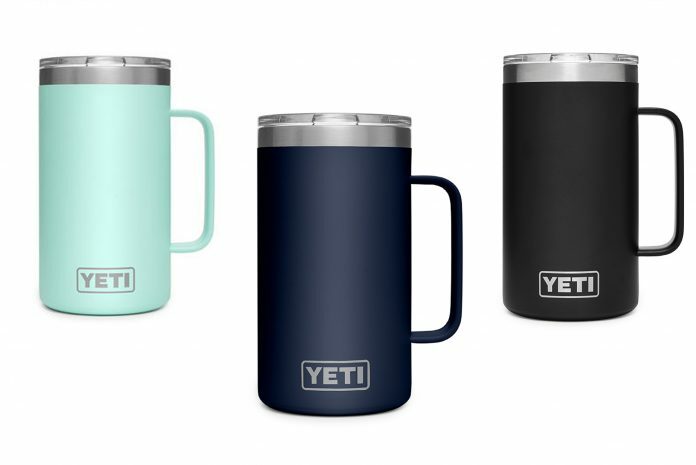 The Rambler 24oz Mug will be available for $29.99 on yeti.com and at official YETI retail partners this Spring in four color options: Stainless, Black, Seafoam and Navy. The introduction of Reef Blue, Sand, and Canyon Red continue YETI’s tribute to outdoor pursuits with color inspired by true events. Inspired by the vibrant, tropical waters surrounding the Florida Keys—serving as the gateway to everything from sailfish to grouper—YETI’s new Reef Blue color is symbolic of year-round opportunities that anglers, divers, and recreationalists alike find in the shallow waters. The new Sand color collection is influenced by the bedrock color of remote adventures, ranging from overlanding through the dunes of Baja, scouting the next best spot for roosterfish, or paddling out when the swell is pumping. To find Canyon Red, YETI went west, to the rugged, high-elevation terrain of sculpted sandstone. These grand mesas and spire summits of the American Southwest hide in plain sight a wilderness that has for centuries been sacred land and has more recently cultivated a climbing community. The Canyon Red collection is inspired by this natural phenomenon and those who set out to explore it. YETI products available in Reef Blue include: Camino Carryall 35, Roadie 20, Tundra 35, Tundra 45, Tundra Haul, Rambler 10oz Wine Tumbler, Rambler 20oz Tumbler, Rambler 30oz Tumbler, Rambler 14oz Mug, Rambler 18oz Bottle, and Rambler 36oz Bottle. For more information regarding YETI’s new Spring 2019 products, please visit yeti.com. YETI is a designer, marketer, retailer, and distributor of a variety of innovative, branded, premium products to a wide-ranging customer base. Our brand promise is to ensure each YETI product delivers exceptional performance and durability in any environment, whether in the remote wilderness, at the beach, or anywhere else life takes you. We bring our products to market through a diverse and powerful omni-channel strategy, comprised of our select group of national and independent retail partners and our DTC channel. By consistently delivering high-performing products, we have built a following of engaged brand loyalists throughout the United States, Canada, Australia, and elsewhere, ranging from serious outdoor enthusiasts to individuals who simply value products of uncompromising quality and design. Our relationship with customers continues to thrive and deepen as a result of our innovative new product introductions, expansion and enhancement of existing product families, and multifaceted branding activities. The California River Quest today announced that it has registered more than 60 paddlers from six U.S. states, Canada and the United Kingdom. Participants range in age from 25 to 75 and include a group of 11 wounded veterans from Team River Runner. Paddlers’ crafts include kayaks, canoes, surfskis, outrigger canoes, standup and prone paddleboards. Paddlers can register as Adventure class or Competitive class. All participants start in Redding, CA at the Sundial Bridge. 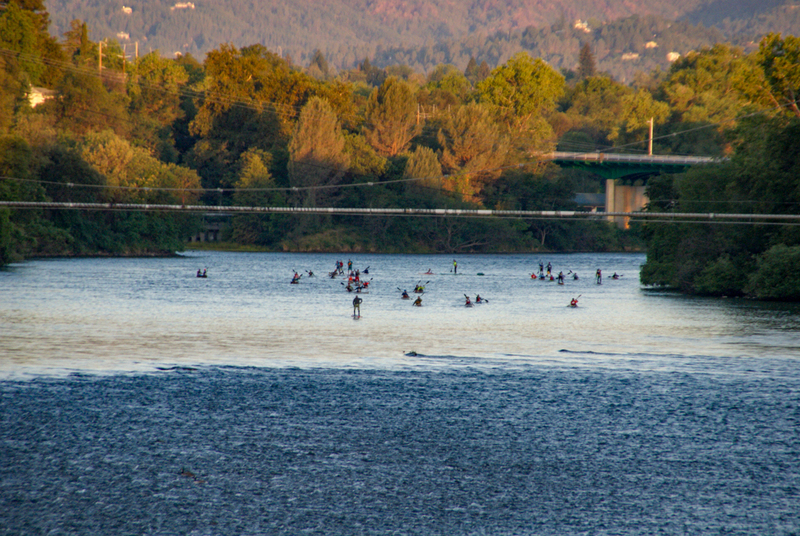 The 25-mile course (the Challenge Quest) takes out at Balls Ferry in Anderson, CA. The 50-mile course (the Ultra-Marathon Quest) takes out at Riverside Park in Red Bluff, CA. The 100-mile course (the Endurance Quest) has a third checkpoint at Woodson Bridge State Recreation Area in Corning, CA and finishes at Bidwell State Park in Chico, CA. The 2019 California River Quest will be held on May 26 with registration on May 25 and a celebration lunch on May 27 at the Sierra Nevada Brewery in the Big Room. There will be a staggered start with the Adventure class taking off at 6:00am followed by Competitive class standup paddle boards at 6:30am followed by the rest of the Competitive class at 7:00am. The California River Quest is not for profit, though it is set up as a business. However, the California River Quest is run 100% by volunteers and profits are donated to organizations that advocate for and protect rivers. This year, Friends of the River will be the beneficiary. Team River Runner believes that every wounded and disabled veteran deserves the opportunity to embrace new challenges, invoke leadership, and promote camaraderie. Team River Runner provides an outlet to fulfill these beliefs – inviting wounded and disabled war veterans and their families to participate in adaptive paddling programs. About Friends of the River Founded in 1973, Friends of the River is California’s only statewide river conservation organization that drives protection and restoration of rivers to support sustainable water solutions through advocacy and education. Its work focuses on awareness of and promotion of solutions that minimize the impact on California’s rivers by optimizing the use and storage of water. 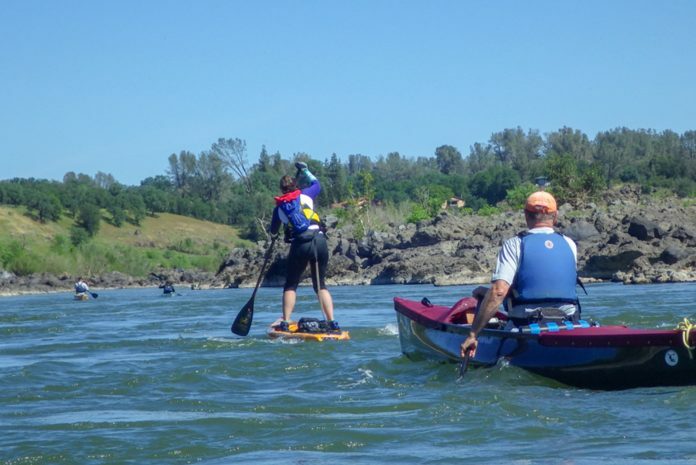 The California River Quest is a paddling event held on the Upper Sacramento River. It provides a variety of course options that makes it interesting for competitive paddlers as well as accessible to adventure paddlers. The California River Quest provides a unique opportunity to paddle special piece of the Sacramento River that remains natural and clean. The course begins at Sundial Bridge and flows through riparian forests and oak woodlands teaming with wildlife and plants as well as a section that runs through a lava canyon. For more information about the California River Quest, visit www.californiariverquest.com.